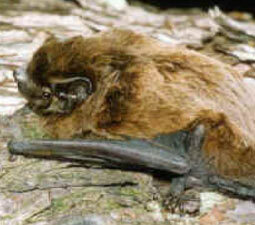 The leisler’s bat is a medium sized species but it is the largest bat found in Ireland. The head and body length of adults can measure up to 7cm with a 4.5cm long tail. They are a bi-coloured species with black to brown fur on the back and a yellowish underbelly. The fur is long and shaggy on the back and at the shoulders. The wing design is long, narrow and pointed reflecting the bat’s fast flying style. The wing membranes are black furred with a large wingspan measuring up to 32cm in length. At their heaviest in autumn adult leisler’s bats can weigh up to 20 grams but will slim down to 15 grams after they emerge from the winter hibernation period. The ears are relatively short and broad with an overall mushroom shaped appearance set high on a dark brown to black mousy face. When in flight they can reach speeds of up to 40 kph usually flying straight above tree level with the ability to swoop and make rapid turns. Their ultrasonic hunting calls range from 20-50khz, which is lower than other Irish bat species and gives a distinctive short metallic hiss type sound. When communicating they will emit short shrill calls giving a zick type sound. Leisler’s bats are primarily a woodland species but will occupy parklands and urban areas that can provide all of their habitat requirements. Naturally they evolved as a species which would roost inside of large mature tree hollows but they will utilize a range of sheltered locations where available to establish their roosts and can be found in buildings, attics, lofts and under outside gables. Several different summer roost locations will be established within a bat’s home range which can be comprised of large maternity colonies containing adult females, their offspring and young non breeding females. In summer males will remain alone or roost with a small group of other males. Winter roosts are more permanent with this bat species remaining inside to hibernate from winter until spring. Leisler’s bats emerge from their roosts to feed early in the evening or just before sunset. They can remain active all night but generally feeding activity peaks at dusk and again just before dawn. They can travel up to 10 km from the roost to a feeding site and tend to hunt most regularly over open deciduous or mixed woodland types. They will also visit parklands, scrubland and urban areas around street lamps. They will not hunt during periods of rainfall. Medium to large insects are a favored food item and are caught when in flight. Such prey includes moths, caddies flies, crane flies and beetles. Smaller insects which gather in large swarms over water or around artificial light sources such as midgets will be taken by flying directly through the swarm. As the leisler’s bat emerges to feed early in the evening their diet will also include day flying insects which are still active at this time such as dung flies. As the leisler’s bat is not highly maneuverable while in flight they do not pick insects directly off foliage as other Irish bat species do. 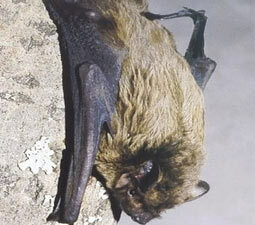 The mating season of the leisler’s bat starts in September and continues until mid November. During this time males will become extremely territorial and attempt to establish mating roosts to which they will gather a number of females to establish a harem. The harem is defended from other males by regular flights around the area. Females are attracted by the male’s calling with up to ten females occupying a harem all of who will mate with a single male. After mating the females will delay the fertilization of her egg until after the hibernation period. Gestation begins in spring and lasts up to 75 days. By this time the female will have joined a maternity roost and will give birth to usually one offspring by June or early July. The mother will wean her young for the first six weeks and she alone will provide parental care. Young bats usually remain within the roost while the mother leaves to forage but if she re-locates to another summer roost within her home range she can carry the young with her. Young bats are capable of solo flight by the time they are one month old. On average the leisler’s bat will live for 8 years in the wild but individuals with a 20-year lifespan have been recorded. The oldest fossils that gave rise to modern bats date from 50 million years ago. Bats are believed to have evolved from small insect hunting mammals which occupied the tree canopy of forested areas of the Eurasian continent. The present day bat family tree now contains 950 different species divided into 17 families. 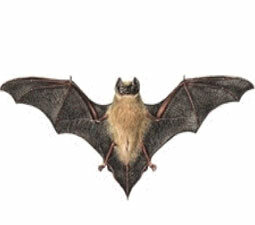 The leisler’s bat species belongs to the Vespertilionidae family in the Chiroptera order which include the brown long eared bat, natterer’s bat, daubenton’s bat and the whiskered bat species found in Ireland. Past climatic changes such as the last Ice Age seriously affected the number and range of bats but they can now be found in most habitats throughout the world except for land areas near the poles. The Leisler’s bat is now widespread throughout Europe but is largely absent from Scandinavia and Portugal and can only be found in pockets in Spain and Italy. The species was first identified in Ireland in 1848 and is now the third most common bat here although Ireland has the largest population of the species in Europe. European populations tend to be more migratory in nature with the Irish colony tending to group together in large numbers. The leisler’s bat can now be found throughout the country in most counties but are absent from some areas of east Connaught and the midlands. The Irish Leisler’s bat population is very important internationally as it is the largest in Europe. Their success here may be due to the absence of other medium sized bats which directly compete with Leisler’s bats such as the noctule species. The leisler’s bat is susceptible to habitat change which has seen a reduction in mature woodlands in Ireland in the past. They have as a result spread to more urban areas in which to establish roost sites which can be destroyed by building renovation or vandalism. The use of chemicals in attic timber treatments can be poisonous to the species. Increased pesticide use in recent decades has seen a reduction in insect numbers on which the bat is totally reliant. 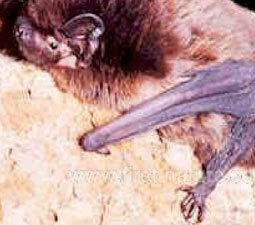 As this bat species only produces one offspring each year any losses are harder to recover from as a result. Recent re-forestation initiatives will in the future see an increase in their traditional habitat types as these forests mature. They are a legally protected species under Irish, European and international legislation which is a reflection of their importance to natural eco-systems and their endangered status in Europe.